This is a single die that cuts all 26 letters. They measure .4 inches tall with ascenders and descenders. These dies are compatible with most tabletop die cut machines. This is a single die that cuts all 26 letters. They measure .4 inches tall. These dies are compatible with most tabletop die cut machines. Craft dies from Tim Holtz and Sizzix featuring letters of the alphabet and numbers. Thinlits create dazzling detailed shapes for more creative cardmaking and papercrafting projects. These wafer-thin chemically-etched die sets are designed to cut, emboss or stencil a single sheet of cardstock, paper, metallic foil or vellum. They are simple to use, compact and portable for cutting at home or on the go. Use them for enhanced intricacy and to add a special touch of inspiration to all your projects. The Thinlits dies in this set are compatible with the BIGkick, Big Shot and Vagabond machines. 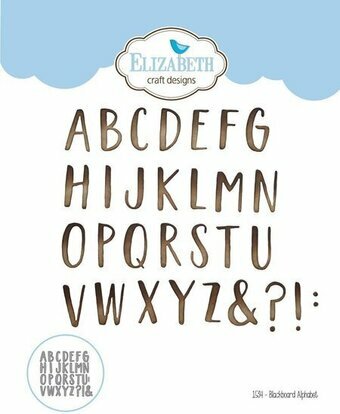 Craft dies from Hunkydory Crafts featuring letters of the alphabet, numbers, and punctuation marks. Sweet Sensations Alphabet dies further add to the versatility of a crafter's stash, by giving you each letter of the alphabet as a separate die, along with numbers and symbols often used in text, to allow you to create your own sentiments or personalisation. Use these to add names to your cards and makes, or even use these large letter dies to decorate bunting! These dies give a fantastic crisp, clean finish. You can even use them with coloured card or mirri card, to create limitless unique looks on your projects. This handy die makes a perfect typewriter background. It also cuts out the numbers and letters, so you can re-arrange them to spell out whatever you like. Includes 1 die. Size: 5.31 x 3.94 inches. Craft die featuring numbers and letters of the alphabet. Spellbinders Shapeabilities cut, emboss and stencil with a single die template. Approximate Size: Height: 5/8", Width: ranges from 5/8 to 1". This is a single die that cuts all 26 letters. They measure .5 inches tall. These dies are compatible with most tabletop die cut machines. This is a single die that cuts all 26 letters. They measure .5 inches tall with ascenders and descenders. These dies are compatible with most tabletop die cut machines. 100% steel craft die from Memory Box featuring the characters A through Z. For use on cardstock, felt, and fabric. Cut, stencil, emboss, create. Use in most leading die cut systems. Craft die featuring letters of the alphabet. Memory Box/Poppy Stamps craft dies are made of 100% steel. For use on cardstock, felt, and fabric. Cut, stencil, emboss, create! Use in most leading die cut systems. 2.7 x 5.4 inches. 6.9 x 13.7 centimeters. Craft dies featuring an uppercase alphabet. Work with any manual die cutting machine. Use with a magnetic base plate and die cutting plate. Embossing folders featuring an ampersand punctuation mark. Craft die featuring letters of the alphabet. Steel cutting die from Elizabeth Craft Designs. Compatible with most leading die-cutting machines. Average Letter Die Size: 0.5" x 1.2", 1.3 cm x 3 cm. Craft die featuring letters of the alphabet in a retro style. CottageCutz are thin metal dies. They are easy-to-use and add great detail to any craft project. Made in the USA. 100% lead free. STICKO-Alphabet Stickers. These stickers are a great way to add an extra element of color and shine to any paper project. This package contains one 3-3/4x6-3/4 sheet that contains 127 stickers. Design: Playful. Imported. Craft dies featuring letters of the alphabet. Karen Burniston dies will give an added touch to any paper project and are compatible with most die-cutting machines. 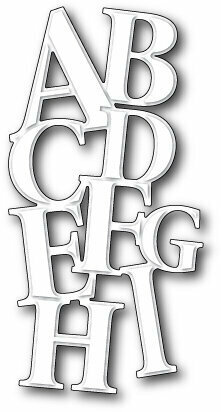 This alphabet set includes 26 individual dies that can be mixed and matched to create your own sentiments. Approx letter size: 1.25 x 1.5 inches. Tonic Studios craft dies featuring lowercase letters of the alphabet. 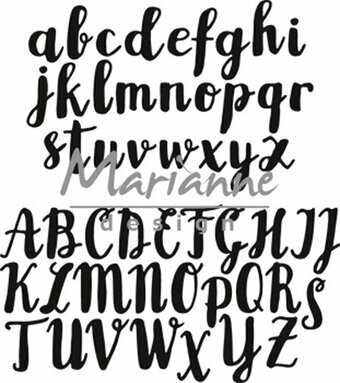 You'll be amazed by all the inventive ways you can incorporate these dimensional letters into your projects. Their size makes them perfect for pairing with coordinating stamped sentiments. Tuck flaps behind the numbers, place them along the top edge of your cards, or conceal them inside your cards for a fun surprise for your recipient! The score line along the bottom of the letters makes it so easy to pop them from the panel. 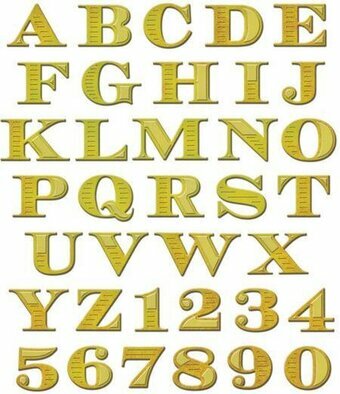 This 27 piece set includes letters and symbols measuring 3/4" in height. MFT Die-namics dies are our very own EXCLUSIVE, American made line of steel dies. Craft dies featuring letters of the alphabet and punctuation marks. Spellbinders Shapeabilities cut, emboss and stencil with a single die template. Approximate Size: Height: ranges from 7/8 to 1 1/4", Width: ranges from 3/4 to 1". Craft die from Altenew featuring uppercase and lowercase letters of the alphabet. There are a total of 27 dies in this set. 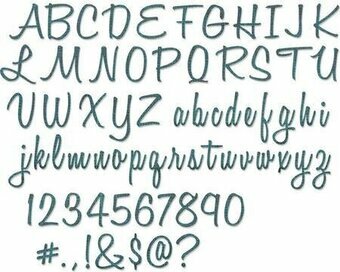 Tonic Studios craft dies featuring uppercase letters of the alphabet. Sticko-Alphabet Stickers. Sticko alphabet stickers are available in a variety of fonts and colors to fit any and every occasion. They are ideal for embellishing cards, scrapbook pages, craft projects and so much more. They make every project pop! This package contains Black Dorchester Medium: 267 stickers on three 9-3/4x4-3/4 inch sheets. Imported. Die set featuring the letters of the alphabet a-z. Contains 26 dies. You loved our bold alphabet, so we decided to bring it back in upper case! 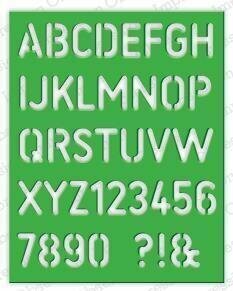 These letters have the same font size as our Bold Alphabet Die Set, so you may use them as-is or combine the two sets. The height of the letters are 1.6" and the width is about 1". There are a total of 26 dies in this set. Craft dies featuring uppercase letters of the alphabet. CottageCutz are thin metal dies, like a QuicKutz. They are easy-to-use and add great detail to any craft project. This die is compatible with the following machines: QuicKutz Squeeze, Revolution, Sizzix / Ellison Big Shot, BigKick, CuttleBug, SpellBinder Wizard and Accucut Zip'eMate. Adapters/shim may be required on some machines. Made in the USA. 100% lead free. The Cricut Cartridge is for use in the Provo Craft Cricut Personal Electronic Cutter or Expression Cutting Machine (both sold separately) which are the perfect paper crafting partner. Creative features transform each character six different ways which makes any layout uniquely yours. Measurements capabilities are: Personal Electronic Cutter: 1" to 5.5", Expression Cutting Machine: 1/4" to 23 1/2". Box includes: font cartridge, keypad overlay, and handbook. Does not include a storage box. This complete set of letters allows you to spell out any greeting you can dream up using jaunty, festive balloons. Customize each card for your recipients' names and favorite colors. The resulting letters are sturdy little characters measuring 7/16" in height. Use them separately or inlay them within the balloons to create contrast in your message. We've also included a number of solid balloons and multiple balloon strings. Use the solid balloons as accents, layer beneath letter and number balloons, or give characters you add from other sets in your collection a festive prop. Birthday card making will be a bundle of fun with this set! This 33 piece set includes: balloons (28) 7/8" x 1 3/16", strings (5) 1/16" x 1 9/16". MFT Die-namics, our very own exclusive American-made line of steel dies. Die-namics dies work with your favorite die-cutting machine. Each die measure approximately 2" x 1"
Use this custom steel die set to personalize birthday cards, invitations, gifts and more. Balloons measure on average: 5/8-3/4" x 1". Our Exclusive Steel Dies are proudly made in the USA. Craft die featuring uppercase letters of the alphabet, along with numbers. Yvonne Creations designs pretty and innovative cutting dies to help you create beautiful cards, scrapbook pages and other handcrafted projects! Can be used with most die cutting machines. Craft die featuring a Modern Alphabet. Coordinates with our ST-17-15 Modern Alpha stamp set. Our Exclusive Steel Dies are proudly made in the USA.